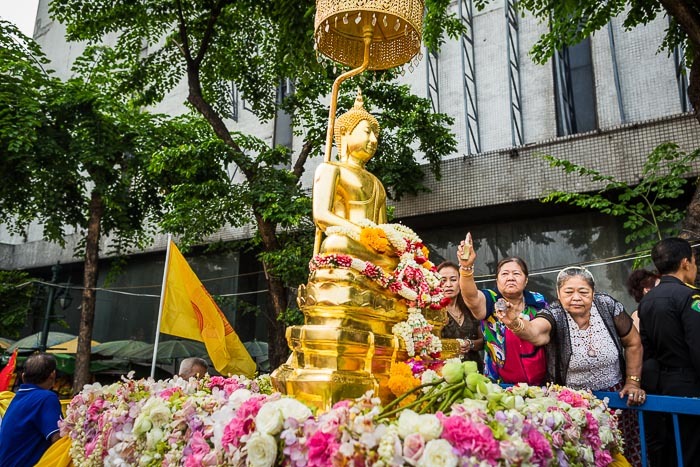 Women spray the Phra Buddha Sihing with scented oils during a stop at Wong Wian Yai in Thonburi. Thailand has the good fortune of celebrating three New Year's holidays. The official one is January 1, which has been the New Year since 1940 or so. There's a large Chinese presence in Thailand, so the Lunar New Year (usually in February) is celebrated widely, especially in communities with large Chinese immigrant populations. And then there's Songkran. Songkran is the traditional Thai New Year. Most of the Theravada Buddhist countries in Southeast Asia (Laos, Thailand, Cambodia, Myanmar) celebrated New Year in April on a date that changed from year to year. Eventually they all adopted January 1 as New Year's Day but kept the old tradition as a holiday. 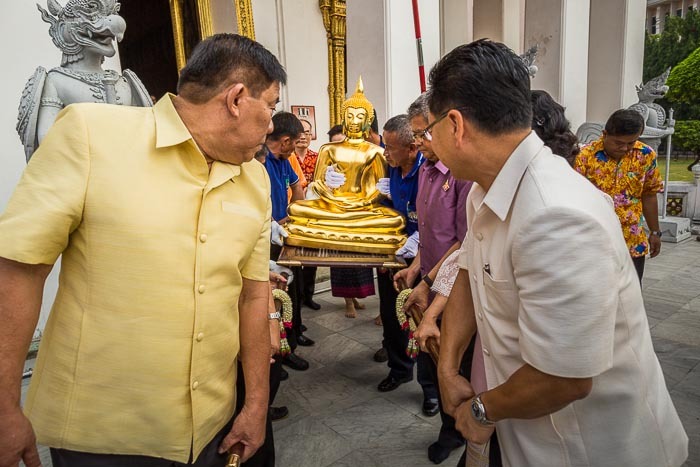 Bangkok city officials carry the Phra Buddha Sihing out of the National Museum before the procession. Bathing Buddha statues with water and oils is a traditional way of making merit and cleansing one's sins. Gently washing the hands of one's elders (also a New Year's tradition) is another way of making merit. Songkran starts on April 13, but on April 12 there's a procession honoring the Phra Buddha Sihing, a revered statue of the Buddha. The procession starts at the National Museum (which used to the "Front Palace") and travels through the city making occasional stops. At each stop people pray to the statue and gently sprinkle it with water and scented oils. It's one of the quieter and more spiritual celebrations of the traditional New Year. There are more photos of the procession for the Phra Buddha Sihing in my archive or available from ZUMA Press.